The PLECTER industrial picosecond laser is a 80MHz quasi-CW laser offering a high level of power and beam pointing stability. 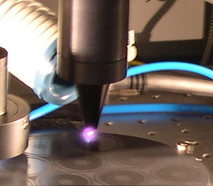 The laser offers more than 10W of TEM00 power at 1064nm or 5W at 532nm; partial conversion to SHG can be specified. The PLECTER has excellent beam pointing stability, waist location stability, and waist size stability. These features make the PLECTER a cost effective platform for various industrial applications in medical equipment, measurement devices and display technology.